For the next ten years or so, to the best of our knowledge, we tried to eliminate the disgrace by putting together some small collections of books and reading rooms which were available to the public. The first was upstairs in the Fagan Pool Hall and Cigar Factory – on Bridge Street, where the tiered seating for the band shell is today. Another was in part of the second floor of the Harsha Building – once Lieberman’s, once Trademark Clothiers, the current Van Pelt 1910 building, which today houses Cherry Republic. 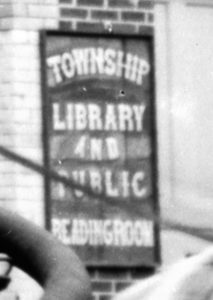 Then finally the stigma was over when a REAL TRUE TOWNSHIP library came into existence in 1886 in the village hall and engine house at the corner of State and Antrim. Effie Berdan was employed as the first librarian. In 1905, perhaps because our village was now undergoing incorporation as a city, the school board minutes report a transfer of the Township Library to the School District, presumably placed somewhere in these school buildings between Mason and Clinton Streets. Cora Bently was hired as librarian in 1906, served for three months, and was replaced by Elizabeth Putman. Miss Putman had an annual salary of $60 and stayed four years. So Charlevoix’s Mayor Hampton posted a letter to Pittsburgh, and this was the reply. The Free Public Library – address 107 State Street – opened on Saturday, July 2, 1910. Edna Sue Green was the first librarian in the new Carnegie. Miss Green may have found the new elegant surroundings too much to handle, or she may have found better circumstances. In any case, by the end of the year, Annie Bon had been hired. She worked at the Carnegie for seven years before resigning to take a position with a Chicago publishing house. With Annie Bon’s departure in 1917, Minnie Payton, W.E. Hampton’s assistant in the Charlevoix Courier office, was elected to the position of librarian by a unanimous vote of the Board of Education. Her twenty-six year tenure would endear her to the community. Florenz Milner, with degrees from the University of Chicago and Columbia, had been teaching mathematics at Charlevoix High School. She was hired to be the interim librarian and stayed two decades. 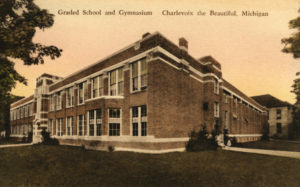 Built in 1927, and used as a school for 75 years, the 220 Clinton Street building would become the 2006 Charlevoix Public Library. On July 5, 1967, 109 Clinton Street opened its doors. It had 7,000 volumes, including 1,600 on loan from the Grand Traverse Library Federation. Margaret Duerr, after whom an annual award is now names, was hired as interim librarian for three months. Dorothy Olmstead, former Genesee County Librarian arrived in July of 1967. In 1972, Marybeth Wallick, a graduate of Ellsworth Community School and a history major from Central Michigan University was hired. She retired in 2001 and Charlie Kregel served as Interim until Valerie Meyerson was hired as director and began a new era of library service. Previously head of the Wixom Library in the suburban Detroit area. She instituted staff training and technology development, and encouraged community involvement. And the community flocked back to the library. 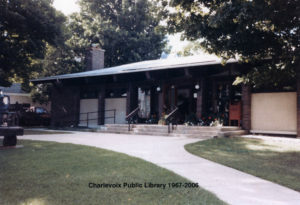 A major change in the life of the Charlevoix Public Library occurred in 1997. 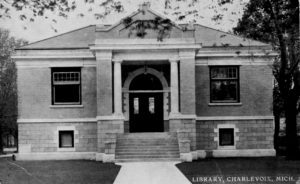 Due to Proposal A, Charlevoix reorganized under the State of Michigan’s District Library Law, which removed the public library from the jurisdiction of the school system. A Library Board of Trustees was appointed. And an operating millage renewal passed overwhelmingly. 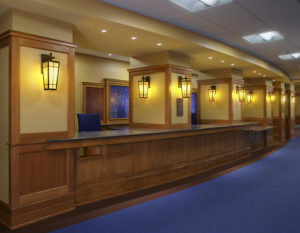 In 2002 planning meetings for a new, improved facility began in earnest. A building committee was established to evaluate and advise the trustees about possible sites – should we add on to the existing building or move? 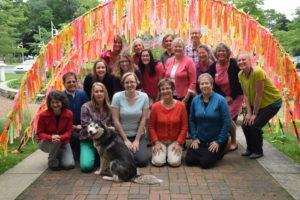 Engberg Anderson Design Partnership, an architectural firm from Milwaukee, was chosen to come to town to get the community’s ideas and create some preliminary sketches. Numerous planning sessions resulted in two certainties. The library HAD to remain downtown, and there was tremendous affection for the 1927 school, which was available. 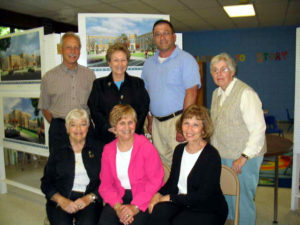 The Trustees decided to pursue the vacant school option. After much negotiation, in the fall of 2003, the Downtown Development Authority and City of Charlevoix publicly embraced the project by agreeing to buy the building from the Board of Education for $635 thousand dollars and hold it on behalf of the library until funding could be secured. 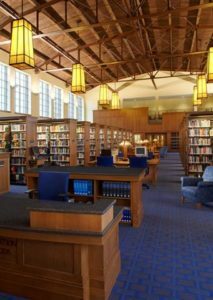 What the library will cost? At the beginning of 2004, feeling that the taxpayers needed to continue to give input and be fully informed about library plans, the Trustees put a number of committees in place and set the millage request. They would ask for .645 mills to renovate the building and .637 mills for future operations of the library. Grant writing began in earnest, and generous foundations responded. A capital campaign of $1 million dollars was thought attainable; by the end, $2 million was raised. Friends held weekly informational sessions with groups of voters, showed the possibilities of putting a new library into the old school, and talked about what it would cost. There were speeches given to every service group in the district to explain the project. The millage committee put together a series of ads and a get-out-the-vote effort. And on June 14, 2004 the millage passed. The project would proceed! 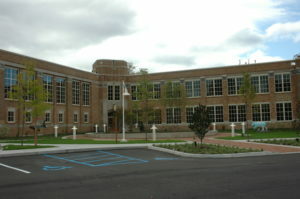 In September 2006, the new library opened. 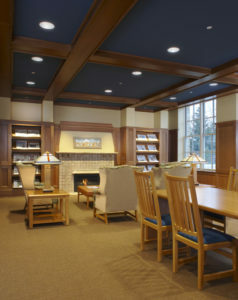 With expanded space, the library’s collection increased to over 40,000 volumes. 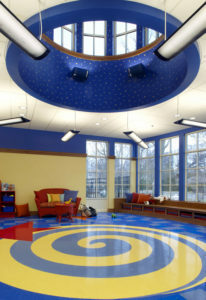 The community rooms made it possible to offer a multitude of programs, concerts and events. State of the art technology in the building made tech literacy a priority in programming. In 2015 Linda Adams was selected to take over the directorship of the library. She had helped to create this space, served as head of adult programing, and had developed an outstanding reputation as a leader. She has an undergraduate degree from Central Michigan University and a Masters of Library and Information Science Degree from the University of Wisconsin. Her extraordinary vision respects the past while welcoming the future. The new Charlevoix Public Library, now ten years old, is a success story due to the hard work and dedication of the Board of Trustees, hundreds of volunteers, the taxpayers of the Charlevoix Library District…but especially……the staff…a terrific group of professionals who welcome everyone, answer questions and make sure this library is a place for everyone to meet, to learn, and to be inspired. We wonder what the next ten years will bring?